Wu C, et al. (2011). Genome-wide association study identifies three new susceptibility loci for esophageal squamous-cell carcinoma in Chinese populations. Nat Genet. 43(7):679-84. PMID: 21642993. Wu C, et al. (2012). Genome-wide association analyses of esophageal squamous cell carcinoma in Chinese identify multiple susceptibility loci and gene-environment interactions. Nat Genet. 44(10):1090-7. PMID: 22960999. Wu C, et al. (2013). Genome-wide association study identifies common variants in SLC39A6 associated with length of survival in esophageal squamous-cell carcinoma. Nat Genet. 45(6):632-8. PMID: 23644492. Wu C, et al. (2014). Joint analysis of three genome-wide association studies of esophageal squamous cell carcinoma in Chinese populations. Nat Genet. 46(9):1001-6. PMID: 25129146. Chang J, et al. (2017). 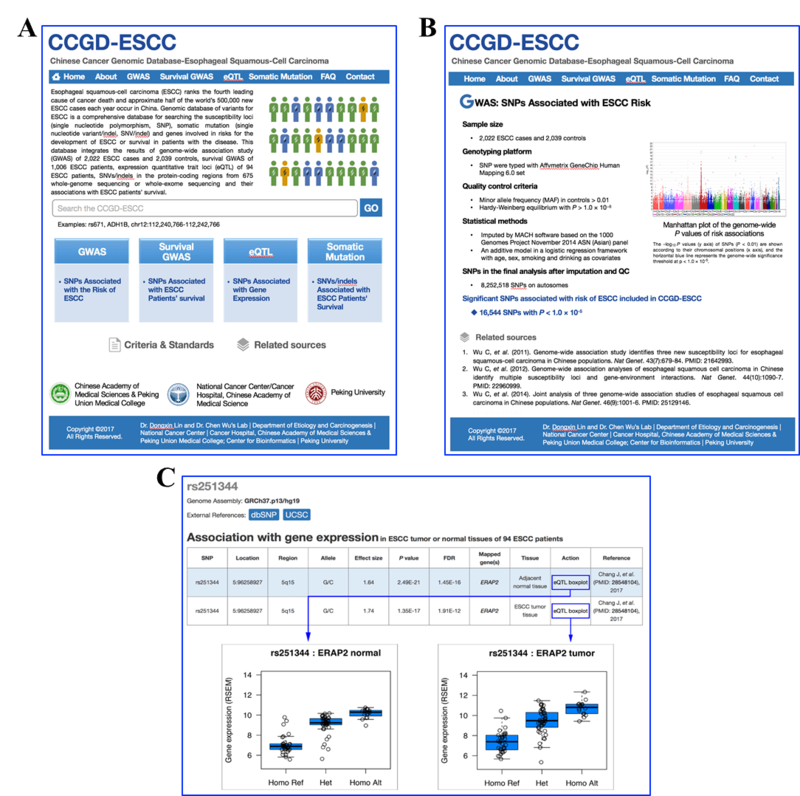 Genomic analysis of esophageal squamous-cell carcinoma identifies alcohol drinking-related mutation signature and genomic alterations. Nat Commun. 8, 15290. PMID: 28548104. Cancer Genome Atlas Research. (2017). Integrated genomic characterization of oesophageal carcinoma. Nature. 541(7636):169-175. PMID: 28052061. Qin HD, et al. (2016). Genomic characterization of esophageal squamous cell carcinoma reveals critical genes underlying tumorigenesis and poor prognosis. Am J Hum Genet. 98(4):709-27. PMID: 27058444. Sawada G, et al. (2016). Genomic landscape of esophageal squamous cell carcinoma in a Japanese population. Gastroenterology. 150(5):1171-82. PMID: 26873401. Zhang L, et al. (2015). Genomic analyses reveal mutational signatures and frequently altered genes in esophageal squamous cell carcinoma. Am J Hum Genet. 96(4):597-611. PMID: 25839328. Gao YB, et al. (2014). Genetic landscape of esophageal squamous cell carcinoma. Nat Genet. 46(10):1097-102. PMID: 25151357. Song Y, et al. (2014). Identification of genomic alterations in oesophageal squamous cell cancer. Nature. 509(7498):91-5. PMID: 24670651.